SAS probably holds the highest market share in analytics solutions for enterprises. With its good data handling and graphical capabilities, SAS is an important tool for a data scientist / analyst. We recently conducted a skill test on SAS. The topic covered in this skill test was Base Programming for SAS. The skill test tested both theoretical & practical knowledge of Base Programming in SAS. A total of 977 people participated in this skill test. If you are one of those who missed this great opportunity to test yourself against other SAS practitioners. Go through the below questions, and find out how many can you answer correctly. You can access your performance here. More than 230 people participated in the skill test and the highest score was 35. Here are a few statistics about the distribution. Q1) Which one of the following is the value of the variable c in the output data set? ** is an exponential operator. Q2) Which one of the following statement can’t be part of “PROC FREQ”? Look at the syntax of PROC FREQ, there is not SET statement required. Q3) We have submitted the following PROC SORT step, which generates an output data set. If we are not providing library name explicitly then it will automatically refer to temporary library “WORK”. Q4) How many variables would be in table “AV” after executing the below SAS program? If we are using any variable name within data step program it will automatically get created in output data set. Here, Three unique variables in both the tables are “name”, “age”, “salary” and one more variable created within dataset “totsal”. Q5) After executing below SAS program, how many observations would be AV dataset? Above you look at input data sets, there is a one-to-many relationship between Employee and Salary. To know more about merging in SAS, click here. Q6) After executing below SAS program, how many observations would be in AV dataset? In this program, we are looking for observations where ins = 0 which means that “name” values not available in table “Salary”. In above table, you can see that only two records satisfy that criteria. Q7) Which one of the following command will help us to rename the column “Salary” to “Compensation” of table “Salary”? Q8) Which of the following statements is not correct about the program shown below? In above program, we are writing to output dataset before END statement which means it will not write last value 2005 to output dataset so last value would be 2004. If we remove OUTPUT statement, last value would be 2005. Q9) How can you limit the variables written to output dataset in DATA STEP? Both DROP and KEEP can be used to limit the variables in the dataset. The DROP= option tells SAS which variables you want to drop. If you place the DROP= option on the SET statement, SAS drops the specified variables when it reads the input data set and if you place the DROP= option on the DATA statement, SAS drops the specified variables when it writes to the output data set. The KEEP= option tells SAS which variables you want to keep. If you place the KEEP= option on the SET statement, SAS keeps the listed variables when it reads the input data set. On the other hand, if you place the KEEP= option on the DATA statement, SAS keeps the specified variables when it writes to the output data set. Q10) Which of the following statements are used to read delimited raw data file and create an SAS data set? SET can not be used to read raw data files. SET is used to read data from one or more SAS dataset. And, following code is used to read the filenamed EMP. Q11) What will be the output if we run the below SAS statements to read “emp.csv” file? INFILE statement start reading a file from first line of CSV and it can be header row also so we need to mention start row explicitly. Q12) Which option will be added to infile statement to read a dataset from the record with employee name “John”? FIRSTOBS option can be used to explicity mention the start row to read. 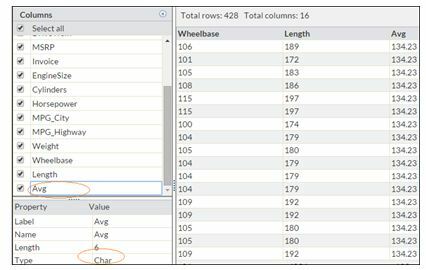 In above table, first row is representing header, second row about table and data set is starting with third row. Q13) Below SAS statements are used to read file “Emp.csv” from third record of csv file. Now, which statement we should add to the above code to read date column “DOB” correctly? To read date column, we need to explicitly mention the format type of date and that can be done using INFORMAT and FORMAT statements. In the snapshot below, you can see that variable “Avg” is in character format. Q14) Which of the following statement will help to convert “Avg” to numeric format? INPUT() and PUT() are conversion function in SAS. INPUT() is used to convert text to a number whereas PUT() to convert the number to text. How many records will it print? Like operator acts as case sensitive and in above table there is no-one whose second character of the name is capital R.
Q16) Which of the following statement will calculate the age of each employee as on 05-Feb-2017? In SAS, date string is always followed by “d” to act as date. Q17) If you submit the following program on above data set, which variables appear in table “Emp”? We have only three variables from input dataset “Manager_EMP_ID”,”Employee_ID”, “Salary” and two new variables introduced “DOB” and “Age”. In Data statement, we have dropped two (Manager_EMP_ID” and “Salary”) out of these five variables. Now variables in output dataset “Employee_ID”, “Age”, and “DOB”. Below code is used to read the file class.csv into a SAS dataset table named class. The total number of observation is 7 only. Which of the following command can be used with “infile” statement to remove these errors? Whenever a read a delimited file using infile statement and if the file has two or more delimiter together (n value between them) or last column data is missing then it takes the next possible value as an input for that column. And, the next possible value can be other column data of same row or next line also. Now, to avoid these reading issues, we use DSD to prevent reading from next column of the same row and MISSOVER for next line or observation. Q19) Which of the following command will find the number of missing marks in all variables of table “Class”. Q20) Which of the following command will help to impute the missing value of column “Hindi” with average marks of “Hindi”? 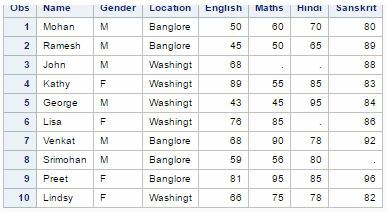 In the first option, we are creating a variable avg_score in the table temp and then using this table data in data step to input missing values of HINDI whereas in option second, we are using table class as an input data set for data step. Q21) Which of the following statements can be used to append the Table-1 and Table-2 having a unique value of Product_ID? To remove duplicate records based on a variable or multiple variables, we use NODUPKEY with PROC SORT or FIRST./ LAST. option to remove duplicate records. For more detail on removing duplicate records, you can refer this link. Q22) With cash crunch (due to demonetization) the company decided to advance the proposed booking date by 2 months (keeping the day intact). Which of the below SAS formula can be used to advance the date? alignment: controls the alignment of SAS dates, within the interval, used to identify output observations. Allowed values are BEGINNING, MIDDLE, END, and SAMEDAY/S. In the second option, you can see that we have used the similar syntax to advance the date value by 2 months. Q23) If the following code will run, what will be the output? “IN” variable does not appear in output dataset. Here, “Proposed_Booking_Date” and “Date” are “IN” variables and we have dropped the variable “Location” in data step. Q24) In Table-2, Location name ‘Delhi’ has been wrongly put, need to replace this with ‘Delhi_NCR’. Which of the following code will complete this task? The length of field “Location” in table2 is 8 so first we need to change the format of “Location”. Here in both options B and C, we have changed the length of field “Location”. Q25) [ True | False] Value of First. BY-variable and Last. By-variable can be same. Yes, it is possible. In case of one unique value for BY variable then this record is the first and last record as well. Q26) Which is pointer control used to read multiple records sequentially? 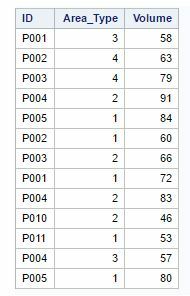 You can use one or more forward slash (/) line pointer controls in your INPUT statements to tell SAS to advance to a new record before reading the next data value. NOTE: The dataset has been loaded in SAS and table name is table5. Q27) Categorical column may contain more than two distinct values. For example, “Married” has two values, “Yes” and “No”. How will you find all the distinct values present in the column “Education”? Proc Means is used to look at the frequency distribution of categories of a categorical variable whereas PROC Means used to explore continuous variables. Q28) How will you create an extra column “Salutation”? If count is positive, SCAN counts words from left to right in the character string. If count is negative, SCAN counts words from right to left in the character string. In above question, we need to extract the first word of string so value of count would be 1 and string variable is “name”. Q29) Which of the following command will help you to create the below table “AV” (Exactly Similar) based on “Table5”? First of all, here we are creating dummy variables for variable “Loan_Status” (also known as One Hot Encoding). Both Option A and B will create these dummy variables but after execution of both program you will not be able to create exactly similar dataset like AV because it will have more number of variables and the values of dummy variables for “Loan_Status_H” and “Loan_Status_N” is swapped in output table “AV”. Q30) Which of the following SAS program will help you understand the relationship between two variables “Education” and “Loan_Status”? 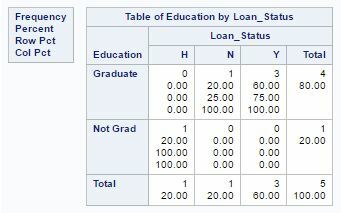 Above, we are trying to create a two-way table based on two categorical variables “Education” and “Loan_Status”. And to create two-way table, we need to place * in between them. If we will separate the variable name by space then this will create two individual frequency distributions for both the variables. Q31) [True | Flase] The two programs below will return same output. In the first program, we have “LoanAmount” in input data set so there would be values 0.4*LoanAmount in “Charge” column whereas, in the second program, we have dropped the variable “LoanAmount” so the value of column “Charge” would be missing because we do not have variable “LoanAmount”. Q32) Which of the following statement can be used to accumulate the value of the variable in a Data Step? Which of the following step, you will take to correct it? We can not apply WHERE on derived or calculated variable(s) so we should use IF for subsetting. Q34) Which of the following statement can be used to transpose table “Base” to table “Transposed”? Both program can be used to transpose the data set, One is array approach whereas in second method, we are using PROC Transpose. Q35) [True | False] “Where” and “IF” always returns the same result. One of the scenarios, we have discussed in question 35. Q36) Which of the following PROC can be used to create “Bubble”, “Scatter” and “Histogram”? PROC SGPLOT can be used to create all above-mentioned charts. Q37) Which of the following command can be used to plot below chart? Above, we are creating three series of line in a single chart and we don’t have any “Line” and “BY” statements in PROC SGPLOT. 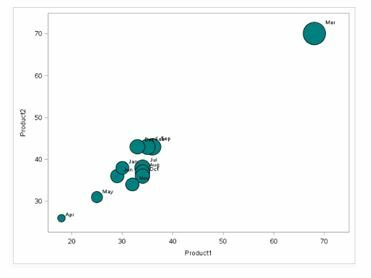 Q38) Which of the following command can be used to plot below chart (Below Product1 is represented on x-axis, Product2 on y-axis and Product3 as the size of bubble)? In bubble chart, we have three variables to visualize. One on x-axis, second one on y-axis and last one as size of bubble. 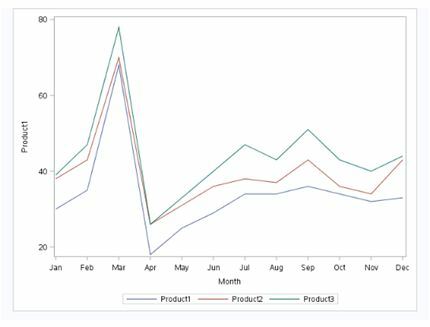 We can create Bubble chart in SAS using PROC SGPLOT with Bubble statement. Q39) Which of the following SAS program will remove the duplicate observation(s) of “ID” and “Area_Type”. And, remove observation having the lower magnitude of variable “Volume”? The basic problem with Option B and C is, “Descending” option is appearing after the variable name which is not the right syntax. In option A, we are first sorting the data set based on “ID”, “Area_Type” and “Volume” (Descending) then again writing a PROC SORT to remove duplicate records based on “ID” and “Area_Type”. Q40) Which of the following program will help to bin the variable volume (Adding one more variable to “Table7”, “Volume_Bucket”)? Select statement works with exact value, it does not compare like greater than or less than so here IF statement will do the task. I tried to clear all your doubts through this article, but if we have missed out on something then let us know in comments below. Also, If you have any suggestions or improvements you think we should make in the next skill test, you can let us know by dropping your feedback in the comments section. In Q8 how will the do loop perform 15 iterations? do loop will iterate 5 times and last year value would be 2005 also but data step will not write this to output data set because we have output statement within loop. Which means it will not write last value 2005 to output dataset so last value would be 2004. If we remove OUTPUT statement, last value would be 2005. The loop will iterate 5 times, so the last statement ‘The DO loop performs 15 iterations’ is also not true and hence the answer to this. Can you please advise? It was a typo here in the solution article. It is actually 5 times. Thanks for highlighting it. First of all thanks for a wonderful test. I have checked all the question and found there are some mistakes ( may be typo). Q6 has wrong answers, as in explanation you have given the correct answer (2 obs) but the option is showing the correct ans is 4, which is wrong. Q18: For the given data only DSD will read the file properly .. however in any other raw data as well if the delimiters are placed properly then we dont need to use missover with DSD as it takes a single delimiter as missing for the first and last variable. we don’t need to use missover here in this example as it will work, but will fail if there are no delimiter at the end for missing values. Q36: In explanation the correct answer is given SGPLOT. but options displays the wrong answer. Hope this help, please let me know in case you think i am wrong anywhere. Hope if you correct the leaderboard again ? Thanks for your feedback and highlighting the typo. Question 6 and 36 have a typo about showing the wrong option as an answer in the solution article although you can see that explanation is pointing towards the right answer. Question 8: Again a typo, option corrected.